The King's Shilling - Recruiting Technical Talent: Job Titles and Perception - Ninjas, Gurus and Rockstars? 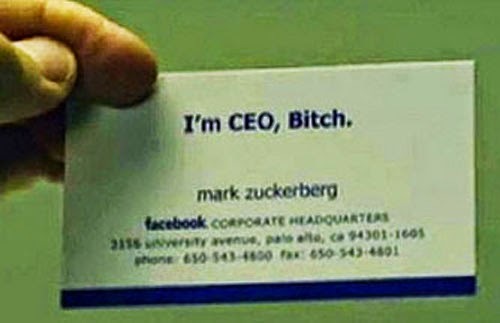 Job Titles and Perception - Ninjas, Gurus and Rockstars? Somewhat unfairly, I tweeted this comparison recently. The photo compares the titles afforded to two luminaries of the technical world. One is Sir Tim Berners-Lee, he implemented the first successful communication between a Hypertext Transfer Protocol (HTTP) client and server via the Internet and is often credited as being the "Inventor of the World Wide Web". 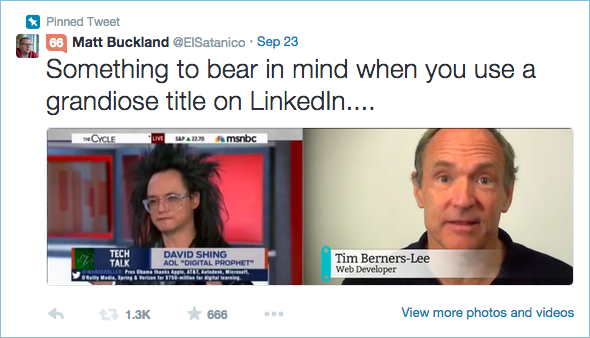 The other is David Shing, a speaker and futurologist for AOL, the American mass media organisation. I offered the comparison, as unfair as it is, flippantly and the seeming disparity for Berners-Lee's humility and Shing's presumption seemed to hit a nerve with the twitter audience. As a recruiter it makes me think. If we can all see a disparity so huge in this example that is becomes absurd why do we still see people using titles that seem at odds with an individual's function in an organisation? All of this might be fine. If the employer you want to work for has this culture you'll fit in well and probably be successful. I don't think it's helpful for potential candidates to seek to be seen in this light. The best technologists I've worked with, "best" here being the feedback from peers and the community, were also the most humble. These were the people who had created tools and languages the world over, known in their fields as leaders and yet they let their achievements speak for themselves. What then of a company that advertises to hire a "Rockstar Developer"? If a company advertises for Ninjas, Gurus and Rockstars does the reader infer that they are a fun place to work with little hierarchy or that the environment will be competitive and celebrate the individual over the team as a whole? For me that distinction is too great of a risk, I wouldn't want the advert to put people off applying for a job they might be otherwise perfect for, at the very least I'd prefer a part of the process to determine their fit rather than their reaction to a joke job title. Whilst this might be true for me and the companies I recruit for if might not be the same for your organisations. For example this video, recruiting developers for Kixeye, might illustrate they'd love some Ninjas to apply. A company advertising might want to take the time to reflect on what their job title means for attraction. Remember that whilst you might love the fact your business card proudly states you're a "Ruby Ninja", a "Marketing Badass" or even the "Chief Instigation Officer" (yes really!) the communication of these ideas is a two way street and your true meaning will always be affected by the listener's own values, attitudes and beliefs. Whatever your job title and however you want to portray yourself, awareness is key. The next time you have to respond to this type of job title this site might help. For employers who might be using these job titles just for the shock value, I'm afraid that time has already passed, perhaps you could consider becoming a not for "Prophets" organisation?